So those Pixeljunk guys, Q Games, released their latest title, Nom Nom Galaxy, on PS4 and PC today. Apparently it had been on Steam early access for a while and went through a lot of changes but now it’s out! You may remember Q Games as the makers of some of the best little downloadable titles on PS3, including Pixeljunk Shooter, Pixeljunk Shooter 2, Pixeljunk Sidescroller, the amazing Pixeljunk Monsters, and a few others. Each of their titles is historically a quirky take on a classic videogame genre. Nom Nom Galaxy is, similarly, another take on a major videogame genre, or more accurately, a few genres. The biggest influence, to me, is Terraria, as Nom Nom very much has the digging and spelunking and air-punching combat gameplay of a Terraria-like game going on. You can even “farm” plants you need just like in Terraria. It’s not just Terraria, though. You’re gathering ingredients in Nom Nom to bring back to your base, where robots you’ve tasked with the job will help you make soup to sell to the galaxy. So there’s an entire base building, resource management, and resource transport element that if anything reminds me of Spacechem meets Cooking Mama. Anyway, it’s still too early to really judge the game but I just put three hours into it without breaking a sweat. (Actually, that’s a lie—I was on an elliptical at the time!) If nothing else, even just jumping in, I can feel myself becoming addicted to it the way I feel when I play Terraria or Civilization or Gratuitous Space Battles... and that’s a good thing! 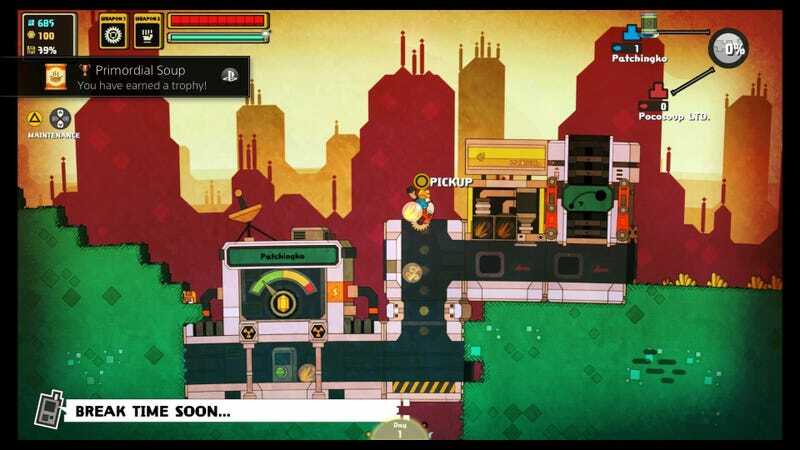 Plus the charming visual and audial appeal of Pixeljunk games is all there. The only problem with it? I did terribly my first game, yet somehow I have a global rank around #100. Either that’s an error or not many people are playing it yet. So... Roll call! Any of you playing Nom Nom Galaxy? What do you think? If not, any plans to? And what do you think of Q Games and their Pixeljunk series in general? What’s your favorite Pixeljunk title?